Whether you want to mount your flat screen to a wall, ceiling, desk, pole or truss, this is the place to find mounting brackets for TVs, monitors, tablets, iPads and all flat screens. From low-profile fixed mounts, adjustable mounts that swing out or rotate to TV ceiling mounting brackets, we have it all. You can even find in-wall recessed mount enclosures that include the mounting bracket or a wall kiosk enclosure for the ultimate, sleek no-show monitor screen installation. For business settings, we have multiple monitor mounts like video walls and menu boards, plus mounting brackets for attaching a flat screen to a pole or truss. We also offer desktop computer monitor mounts for use in home or office environments. Placing your flat screen TV or monitor on a floor stand is an option for both home and business settings. TV stands and credenza cabinets are traditional used in home settings but can be used in business settings while mobile flat screen carts, flat screen floor stands, kiosk stand enclosures and motorized TV lifts are most often used in business, commercial and retail settings. AV carts with monitor mounts, computer carts and mobile flat screen carts are portable monitor stands that are useful in presentation settings. Flat screen floor stands are used in a multitude of environments, home and business, as they can hold one or more monitors. Multiple monitor stands can be used to display separate images, or used together side by side to project one large image. They are popular at trade shows, in conference rooms and occasionally used as TV stands in contemporary homes. If your looking for a way to store and display your audio components, you've come to the right place. Most of the audio racks that we offer have open shelves. They are high quality, attractive and functional. VTI is our most popular brands. Most of VTI's audio racks are modular, so you can add shelves now to hold your existing components, or add shelves later as your audio equipment needs change. Plus all of the audio racks are available in the most popular finishes in regard to shelving, poles and cap colors. The majority of our audio racks can be used with casters, making them mobile, portable and easy to move. Amp stands that match the audio rack exactly can also be found in our audio racks category. You'll find all you need to organize those audio components and show them off in the way that you want to while also making it easy to use them in the way that you enjoy. Often used in in the recording industry and other audio professionals, component racks to mount their equipment in way to make them user friendly. RIAA pro component racks are usually build-to-suit racks that require the user to choose a rack, and then afterward choose parts to complete the rack to their own specifications. We supply the component racks, as well as the parts needed including rack faceplates and frames, rack shelves and drawers and more. 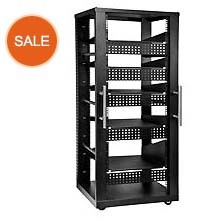 For those who want them, we offer rack doors and side panels as well as electrical components like rack fans and rack casters, and power strips.. The end result of building an AV component rack is that the user has created a highly useable and functional audio video component system that is organized, secure and easy to use. An added benefit is that fact that they are somewhat modular. They can be altered and added to as time goes by and your needs change with equipment additions or changes. Used in boardrooms, conference rooms, classrooms, auditoriums and more, presentation stands are essential to delivering your message. We have a wide range of multimedia podiums and lecterns, from simple podiums to modern lecterns with teleconferencing abilities like added flat screen monitors included. Multimedia lecterns come in a variety of sizes with features like adjustability, add-on shelves, microphones, storage shelves and more. For virtual meeting places, video conferencing carts and stands can come equipped with monitor mounts for large screens or or multiple monitor mounts for viewing several images at once. 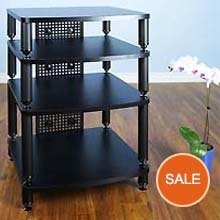 Many presentation stands come with casters for easy mobility so you can easily move them from room to room as needed. The conferencing or presentation environment as well as your presentation goals will dictate the functionality you need from your presentation stand. We offer many podiums, lecterns, video conferencing stands and teleconferencing stands to choose from, as well as many ways to customize those stands to meet your specific needs. 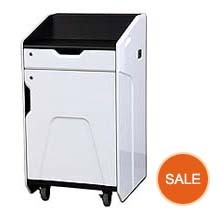 Multipurpose utility carts are useful in settings like offices and classrooms. Casters and their light weight materials make them easy to move. Some come with cabinets, and some of those cabinets lock for security. Utility carts come in a variety of fun colors: green, blue, red, yellow, orange and more. 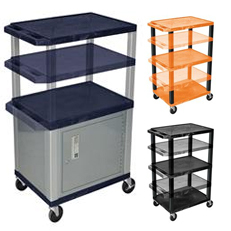 We offer a full line of Luxor utility carts in every color of the rainbow. Handles and casters make moving carts and the AV equipment on them easy. Light weight, yet sturdy molded plastic shelves add to their easy portability. Utility carts often include 4- 6 shelves at various heights for convenient storage. Also helpful are the cable management clips for keeping wires organized and out of the way. Carts that are available with storage cabinets allow you to place item out of view, or lock them away. Of course keys are included. Electrical outlets with built in wires are included with some utility carts, especially those designed to hold audio video equipment. If your goal is to mount your monitor on the wall in a way that will hide the mount or any other associated gear, you need an in-wall mount enclosure. Integrated electrical cable routing, power and signal cable knockouts and landscape or portrait installation options make TV monitor mount enclosures the ultimate low-profile mount option. Many in-wall mount storage boxes can be installed pre and post construction installation. Paintable flanges to make easy work of matching the boxes to decor and making them as invisible, or low-profile, as they can be. Depending on the mount enclosure or box that you choose, you may need to choose a monitor or TV mount that is compatible with the box. There are some TV monitor mount enclosures that come with the mount included. This mount-enclousre combination makes coupling easy, but not entirely necessary. If you need help finding or matching a mount enclosure with a mount for your monitor, we hope you'll give us a call at 1-800-807-1477. Our installation mounting experts are happy to help. Hanging a projector from the ceiling, and placing it at the exact right place has been made easy with projector mounts. Quick installation with completely pre-assembled mounting interfaces as well as projector mounts that are fully adjustable ensure that your projector will project exactly as you want it to. Choose a short-throw projector mount arm if you want to mount your projector to a wall. 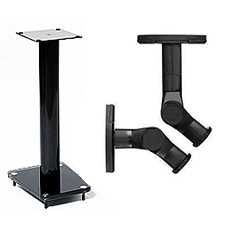 Projector Mounting Accessory Bundles are a complete all-inclusive solution for the home theater enthusiast who wants an easy uncomplicated mounting solution. Adjustable drop columns, suspension wires and quick-release mechanisms allow for infinite placement scenarios. All projector mounts include some integrated cable routing to ensure a cleaned up, professional installation appearance. When you need to drop a projector a considerable depth from the ceiling, you will need to use a NTP pipe. Your find those in our Projector Mounting Accessories category. Our projector mounts easily mate with 1.5 inch NTP pipe. We also offer suspending ceiling adapters. Speaker stands and mounts are essential when you want to create an ideal listening environment. You place the stand or mount at the exact right height, or place them on the ceiling or out of the way to preserve floor space. Audio reviewer can tell you that position and direction are essential to the optimum listening experience. We offer speaker stands at fixed heights, but we also offer adjustable speaker stand. If you want to put those speakers on the wall, we have speaker mounts that will help you achieve that goal. Audio enthusiasts, even audiophiles, know that sound placement is a important element in every audio set up. When you want a maximum listening experience, you will need to find a way to place your speakers at maximum listening levels. You do that with speaker stands and speaker mounts. We have those for you. Our goal is to provide you with the stands and mounts that will allow the best possible listening experience. Enjoy! When you want to store or display your electronic components and other AV gear near your TV, you'll want to use a component shelf. Cable boxes, DVD players and gaming systems make add-on shelving a necessity. Wall mounted component shelves are easy to install near your already mounted flat screen. There are also component shelves available as accessories to pole style monitor stands. Camera shelves are a popular add on to teleconferencing stands, as are additional shelves for electronic components and media players. We also offer wall-mounted camera shelves that can be mounted below or above your TV screen. When choosing a component mount it's important to note not only the shelf size but also the weight or load capacity. If you plan to use a component shelf in a high traffic or public setting, you might consider a storage shelf box with a lock. There are many shelves and features to choose from. If you need any help finding a solutions to your shelving needs, give us a call. We are happy to help. This is the place to look for anything electronic including desktop power centers, surge protection, speaker sound bars, projector wall mounts with audio speakers, outdoor TVs with speakers, touch screen Kiosks and remote controls. The add-on accessories in our electronic section are added to carts or stands to enhance their usability. The outdoor kiosks in this section include the touch screen Adding speaker to AV mounts or stands is made easy with a sand bar Add audio with a compact power amplifier to enhance your projector or other video components. Look here for everything you need to install or enhance your AV mount, stand, cart or presentation furniture. You'll find projector mounting accessories, monitor stand and cart accessories, ceiling plates, adapter plates, anchors, screws, fasteners, NTP pipe extension columns, couplers, clamps and more. There are so many kids of AV mounting installation accessories to aid you in your goal to make things work exactly the way you want them to. We can also help you make things look the way that you desire. We have visual enhancement items like pole covers and wire management. We also have component rack accessories like foot plates to keep the spikes on your audio rack from creating vibration, noise or scratching the floor. You can choose to add shelves to your audio rack here too. Need to boost up the presentation ability of your presentation stand or podium? Browse through the presentation stand accessories. Our expert mounting professionals know what will work for you, so if you'd like some suggestions and ideas, give us a call. We'd love to hear from you.